​Brian MacKenzie has been involved with the Scottish community in Montreal for many years. Brian's interest started with bagpiping at a very early age when he received instruction within a program sponsored by the St. Andrew's Society of Montreal and the Black Watch (RHR) of Canada. Brian was able to learn the bagpipes and join the cadet corps and later, the regimental pipes and drums, becoming the Pipe Major of the Royal Highlanders of Canada in the mid-1990s. Brian's passion for the Great Highland bagpipe has been a driving force behind his interest in the Scots community in Quebec. He has worked with many colleagues who share the same community interests to ensure that the culture continues to thrive throughout La Belle Province. His work with the Montreal Highland Games and, most recently, with the Kinnear’s Mills Celtic Festival and the Trois-Rivières Celtic Festival is reviving interest in Quebec's rich Celtic history. Brian has helped to establish the Black Watch Scottish Arts Society, of which he is currently the President. This organization helps to develop pipers, drummers and, in conjunction with the Stephenson School of Highland Dancing, Highland dancers. He has helped organize activities with the Quebec Piping and Drumming Society and is now working closer with the Atlantic Piping and Drumming Society. In recognition of his musical and community contributions, Brian received both the Queen Elizabeth II Golden Jubilee Medal in 2002 and the Diamond Jubilee Medal in 2012. He is also a recipient of the Canadian Forces Decoration. Brian is a past president of the St Andrew's Society, and has had the distinct honour of working with members of the Society on projects that include hosting the Ayrshire Fiddle Orchestra in Montreal West, the creation and official recognition of the Montreal 1642 tartan, supporting and leading the first Quebec pipe band to compete at the World Pipe Band Championships in Glasgow, and helping to establish the youth committee within the Society. Brian is married to Julie Perron and they have one son, John. Brian is also father to Alexandra and Jason. His efforts today include working on genealogy studies with members of his family: together, they have been able to trace their family roots back to the mid-1700s in the region of Ross-shire. Brian is honoured to join this esteemed list of Scots and those of Scot's heritage who have preceded him, and is grateful to the many people in Montreal and throughout Quebec as we continue to promote and support this wonderful community. Bruce Bolton is a born Montrealer who on his 10th birthday was ordered by his mother to learn bagpipes with the St. Andrew’s Society learners' program. He began lessons at the Black Watch (RHR) of Canada which shaped his life and career. Being with the Regiment continued a family tradition—Bruce's father had been a Sergeant Major during WWII and was wounded three times. He became Cadet Pipe-Major, and in 1966 joined the 78th Fraser Highlanders as a historical military re-enactor with the Montreal Military & Maritime Museum, now the Stewart Museum, during the summer months while he attended McGill University (BSc 72). On graduation he began full time employment with the Museum, where became Executive Director a few years later. His museum duties included directing the re-reacted 78th Fraser Highlanders who performed at the Stewart Museum on Île-Ste-Helene during the summer months. The 78th’s support organization in Montreal grew over the years and now includes garrisons across North America. Bruce is the Regimental adjutant. One of the highlights of his career with the 78th was a two-hour private audience with Her Majesty the Queen and Prince Phillip at Balmoral Castle, Scotland in 2007 when the squad performed for the royal couple. In 1970 he joined the 3rd Battalion, the Black Watch, and was appointed Pipe-Major in 1974, and then in an unprecedented move, was appointed Regimental Sergeant Major in 1978 for two years, when he returned to Pipe-Major. In 1983 he was commissioned from the ranks to Captain, began his infantry officer courses which led to his appointment as Commanding Officer in 2000. He was appointed a Member of the Order of Military Merit in 1984 and he retired in 2005. In November 2017 he was appointed the Regiment’s Honorary Lieutenant-Colonel. Continuing with the Macdonald Stewart organization on a full-time basis, Bruce Bolton was appointed Executive Director of the Macdonald Stewart Foundation in 2004. 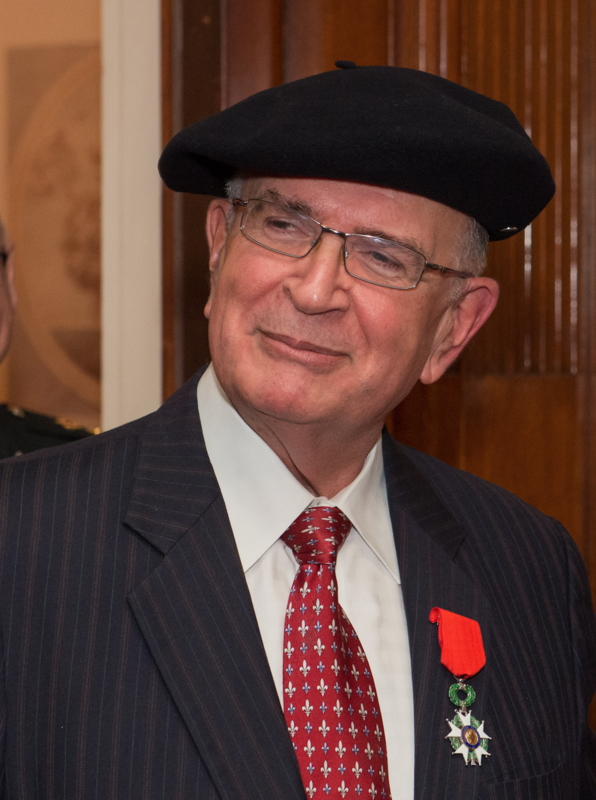 In 2017 he was appointed Chevalier of France’s Legion d’Honneur in recognition of the Foundation’s and Bruce’s commitment to a strong Franco-Canadian exchange. Throughout this time Bruce was heavily involved in Montreal’s Scottish community. He was a founding member of the Montreal Highland Games Society. He was a key player in the 1992 Scottish World Festival which morphed into the Quebec Thistle Council where he was Chairman for a number of years. Bruce also moved through the ranks of the St. Andrew’s Society of Montreal from member of Council, the 2ndVice-President, 1stVice President and St Andrew’s Ball Chairman, and then President of the Society from 2011-2013. Bruce served on the Fundraising Committee which established the McGill Chair in Canadian Scottish Studies. He is Chairman or Director of a number of not for profit organizations, most with Scottish connections. He is President of the St. Andrew’s Presbyterian Homes Foundation, Deputy Clerk and Ruling Elder at the Church of the St Andrew and St Paul, President of the Royal Highlanders of Canada, Vice-President of the Atwater Library, a Member of the Board of the McCord-Stewart Museum, past chair and Trustee of the Trafalgar School for Girls, Governor of the Trustees of the Chateau Ramezay Museum and Treasurer of the Black Watch Scottish Arts Society where he plays his bagpipes (when he finds the time) with the Black Watch Association Pipe Band. LCol Bolton is married to Roberta Cascadden, and has two daughters, Sarah and Laura. In his spare time Bruce still enjoys teaching bagpipes and is a collector of clocks and horse brass. ​James Allan was born in Kinnears Mills Quebec on September 3rd, 1968, he is 7th generation and comes from a long line of Scottish ancestry. His parents, Lawrence Allan and Audrey Guy were active in the community. James can trace his roots back to Bannochburn where his ancestors farmed the land prior to emigrating to Canada. When arriving in Canada his fore-bearers were granted 500 acres of land in the Kinnears Mills area and each of the three sons received 100 acres. An interesting anecdote to the parcels of land was that each lot was named after farms in Bannochburn -- Burnside farm for example is where James lives today and is named after a farm in Bannochburn -- both the Burnside Farm and the Kinnears Mills farm have streams running down through the property. Another farm in Kinnears Mills belongs to his brother and is named Blinkbonnie. James is a carpenter by trade and also sits on City Council, he has remained in Kinnears Mills all his life and his family has continued to promote the Canadian-Scottish culture within the region of Kinnears Mills, Inverness and Thetford Mines. James is President of the Heritage Kinnears Mills and through this effort has helped to maintain celtic roots information in the area along with helping to restore and maintain the four churches in the town -- Presbyterian now United Church, the Methodist, Catholic and Anglican Church and is a member of the Megantic English-Speaking Community Development Corporation. James also dabbles in different farming activity including producing maple syrup the 'old way' by gathering the buckets with horses. James connection to the Scottish Culture has been evident throughout his life, his uncle Richard Allan designed the Eastern Townships tartan. James learned to play piano and bass fiddle at a young age and has played with many celtic bands over the years, as well as calling square dancing. He organizes the annual Kinnears Mills Celtic festival which has blossomed over the last 8 years and with his dedicated had work continues to receives grants to help continue to grow the festival. James organizes the annual Robbie Burns evening and this event enjoys a continued growth in attendance. 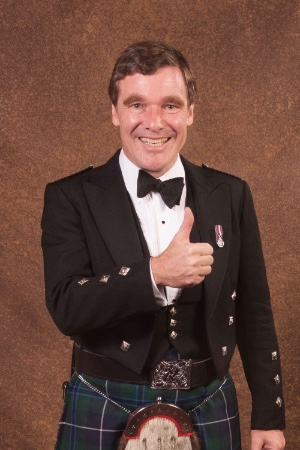 ​Ian Aitken has been a solid supporter of the Scottish Community in Montreal for decades. Serving on Council of the St. Andrew’s Society and then as its President, Ian quietly yet in a businesslike manner introduced new methods to running the Society while at the same time passionately promoting everything the Society did. 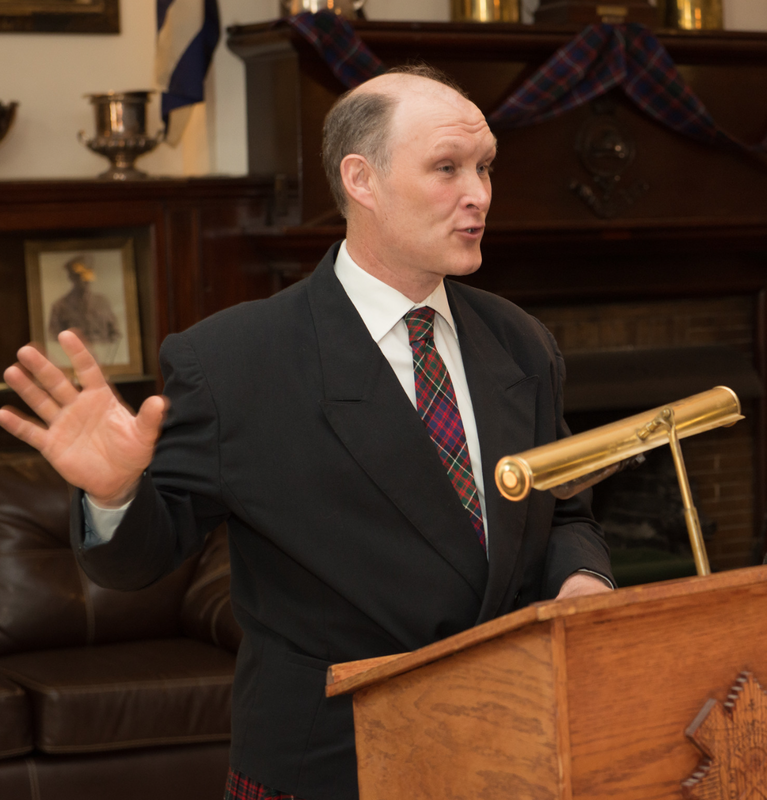 He was instrumental in reviving the Montreal Highland Games in 2014 and remains a generous supporter both personally and through his company – Pembroke Management, where he is the President and Chief Executive Officer. 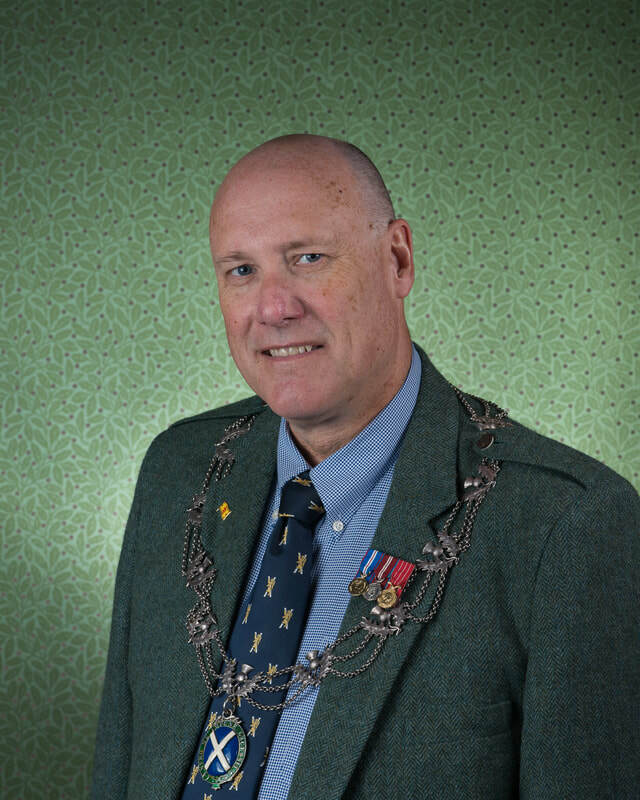 He is an organizer of the Alex Hutchison Award for piping, an Honorary Member of the Black Watch Pipes and Drums, a member of the committee establishing the McGill Chair in Canadian-Scottish Studies and a Patron of the National Trust for Scotland. Ian is devoted to building a more entrepreneurial country and is the Founder and Chairman of Enactus Canada and a Director of the John Dobson Foundation. Ian spent many summers in the Highlands of Scotland as a child and has been one of Montreal’s links to the old country. He has danced at the Royal Caledonian Ball, been invited to the Palace of Holyroodhouse and facilitated the invitation of many of the Guests of Honour to the St. Andrew’s Ball. ​Ian’s passionate commitment to promoting the Scottish community and preserving its legacy over many years, in many ways,makes him a model “Scotsman of the Year”.